An inflatable jacket more often yellow or orange in color and made of rubber or similar material. 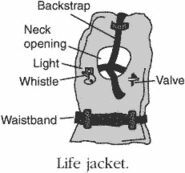 The jacket is worn by aircrews and passengers as an aid to survival in the event of ejection over the sea or ditching. While the original life jackets are sold with the price of 70 Turkish Lira. The 21-year-old, from Dalbeattie, in Dumfries and Galloway, said: "We will never know if wearing a life jacket would have saved Steven's life, but we do know that if he was wearing a life jacket they would have been much more likely to have found his body. We didn't manage to speak with 'Q' directly about the design, but our team put together a design based on our Newton Challenger life jacket, which is supplied to the leisure industry. Craig Currie, 30, and three pals might have survived if they had worn properly functioning life jackets, a fatal accident inquiry heard. Five divers in the sea managed to get ashore but two other adults and the girl aboard the dive boat had no life jackets. The study found the rate of life jacket use among youth was nearly 99 percent for personal watercraft or water skis but only about 60 percent for all other boats. Volunteer RNLI crews on the North East coast have become the first in England to receive state-of-the-art life jackets that are a far cry from the original jackets worn by Whitby lifeboatman Henry Freeman in this picture taken 132 years ago. The night will raise funds to help equip the volunteer crew of Tynemouth RNLI lifeboat station with new life jackets. One advertisement in a recent issue illustrates a situation that I know, at least in South Carolina, is quite illegal--showing two quite young people going all out in a boat with no life jackets on. A toddler may need an "infant" life jacket simply because he weighs less than 30 pounds. I was able to use the inflatable kayak and paddle out and get behind the rock and then fortunately Sarah was able to hold on to that inflatable kayak while I got out of it and up on to the rock and once I got on the rock I was able to grab onto her life jacket and pull her free," Fourney told KBCI TV-2 News in Boise. The postcard perfect day of sailing on Lake George suddenly turned horrific on Sunday when the 40ft Ethan Allen flipped over so quickly that none of the 47 passengers could put on a life jacket.